Schola is always looking for talented singers of all voice parts to join the choir. 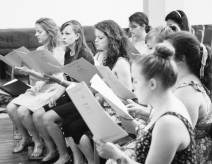 While most auditions are held at the start of the academic year, it may sometimes be possible to join the choir at the start of other terms. The time and location of your audition can be arranged with our auditions secretary. Recent projects have included a collaboration with the Orchestra of the Age of Enlightenment at our 55th Anniversary Reunion concert, a sell-out performance of Duke Ellington's Sacred Concerts in with the Oxford University Jazz Orchestra, a UK Tour in 2015 and our most recent tour to China in July 2018. "Schola Cantorum is a unique experience to perform at the highest level in Oxford and beyond, and the support and encouragement from Jamie and the rest of the choir has made a real difference to all aspects of my singing and music making."